Heat oven to 150°C. Make sure kale is dry, then place in a bowl, sprinkle sea salt over and massage the oil lightly into the leaves. Take care not to drench the leaves with oil as this can cause them to become soggy. 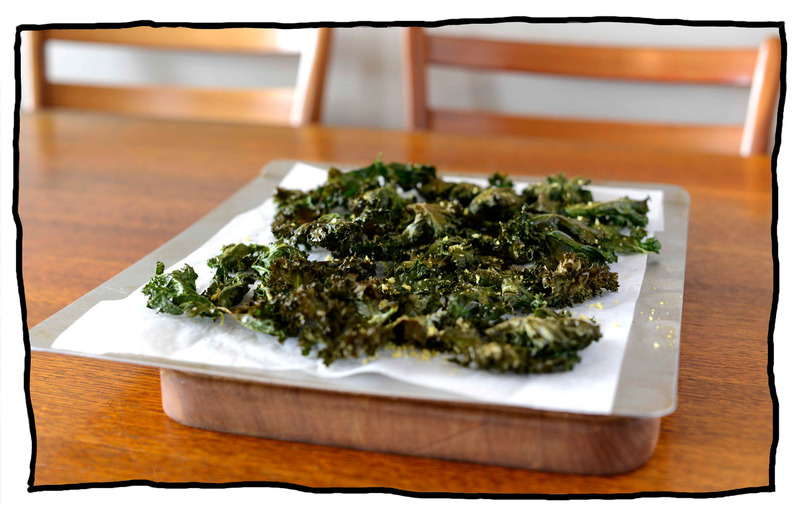 Cover baking trays with cooking paper, then arrange a single layer of kale on the tray. It’s better to have two trays or bake them in two batches than loading up the kale on one tray, as again, it may cause sogginess. Bake for 10 minutes, then take out of the oven and re-arrange less well-cooked leaves. Bake for another 10 minutes, taking care not to overcook the kale. The chips are ready when they melt in your mouth. If you have to chew them, they need a bit more baking time. Sprinkle with lemon zest and/or finely grated parmesan cheese. Fussy eaters and people who don’t like greens fall for these!